The Free Flex iPad® Mount and Docking Solution is everywhere you need it to be. Thanks to the unique stand, Free Flex iPad® Mount can be placed practically anywhere. Whether on your desk, on a shelf, or in the kitchen: The Free Flex integrates your iPad into every environment and keeps it safe through our unique locking systems. The Free Flex can be mounted or mobile with a high quality stainless-steel base. It rotates and locks from portrait to landscape at the touch of a finger, and the engineering of the stand allows for full rotation in all three dimensions. Just like our full range of products, a USB cable charges the iPad and a lock and key system gives you security and peace of mind. 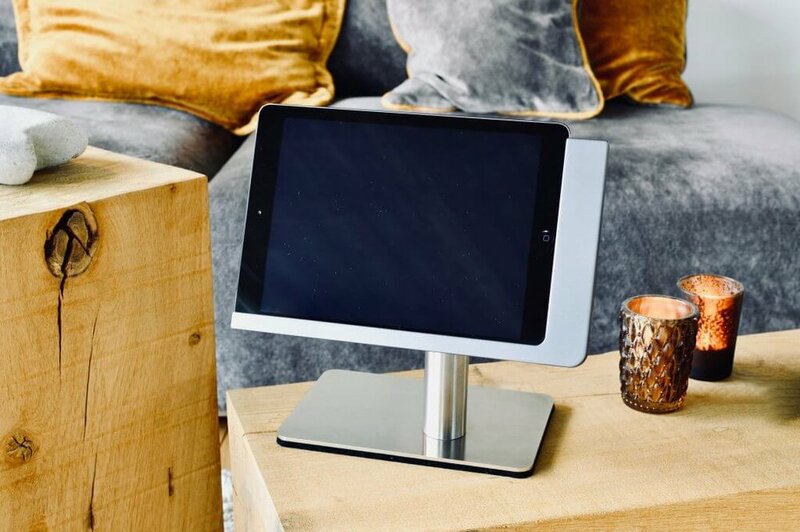 Intuitive and intelligent design; the special rotating joint in the Free Flex allows the iPad to turn 360 degrees, tilt 180 degrees, and switch from portrait to landscape orientation. Don’t worry if your tastes or surroundings change - the design cover can be replaced in just a few quick steps, making it simple to change the appearance of your command center. Place your iPad in a Free Flex and remove it at any time – even with just one hand. You stay flexible and mobile. The perfect fit ensures that the iPad is charged reliably. The soft felt covering protects the surface. Should your iPad require heightened protection, it can be secured with a lock and key system to protect against theft. The Free Flex is built with the longevity of the iPad in mind. It's minimal design allows for better cooling functionality, and the low power USB adapter keeps your iPad optimally charged and ready to use at all times. The Free Flex is customizable and available in Super Silver and Dark Steel aluminum, can be mounted or mobile, and the stand height can be specified to meet any need. Integrate the most intelligent display solution available into your workplace. With our Viveroo product, your iPad is securely held, continuously powered, connected, flexible, and lockable. Viveroo’s solutions provide a reliable and effective setting for getting the most out of your iPad. Viveroo products offer a wide range of applications and provide new ways to interact with your customers. Let us enhance your communication processes by adding a special experience factor. Make your business smarter with Viveroo. We offer tailored product solutions for different businesses, and can advise you on the ideal product for your company. Send us a message to info@viveroousa.com to get started.